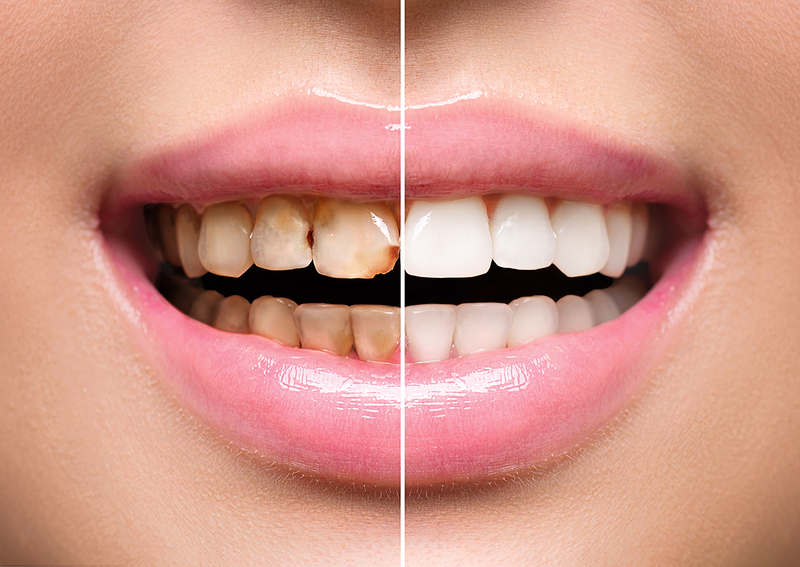 When considering the color of your teeth, keep in mind that dark or discolored teeth may suggest an aged mouth. A well-shaped smile comprised of bright, white teeth lends to a youthful appearance. The shade your dentist selects for teeth whitening and veneers is carefully evaluated with special consideration given to the tone and color of your face and hair. Cosmetic dentists are skilled at finding the right balance between providing you with a brighter, whiter smile and maintaining a natural tooth color. Missing Teeth: One or more missing teeth can negatively affect the appearance of your smile – as well as affect your bite and increase your risk for tooth decay – making replacement an integral part of oral health and facial esthetics. Missing teeth can be replaced by dental implants, bridges or partial dentures. Harmony and Balance: Uneven, chipped and cracked teeth can be cosmetically bonded for an improved appearance, and a gummy smile can be re-contoured to help improve the overall look of the smile. Fuller Lips, Smile and Cheeks: An unshapely or aging face can be improved or rejuvenated with certain procedures in the smile makeover category, including orthodontics and/or oral maxillofacial surgery. A cosmetic dentist will work closely with you to develop a treatment plan designed to achieve exactly what you want from your makeover. This treatment plan may consist of many cosmetic and functionally restorative procedures, potentially including teeth whitening, composite bonding, veneers, dental crowns, orthodontics (braces), oral maxillofacial surgery and gummy smile reduction. For more information please feel free to call our office at (956) 318-3384 or send us an email by clicking HERE. Our office is located in Edinburg, TX near McAllen, Pharr, San Juan, Alamo, Donna, Weslaco, Mercedes, La Feria, Harlingen, San Benito, Olmito, Rancho Viejo, Brownsville, Los Fresnos, Port Isabel, South Padre Island, Laguna Vista, Bayview, Raymondville, Elsa, Edcouch, Linn, San Manuel, Mission, McCook, Alton, Palmview, Palmhurst, Penitas, Sharyland, La Joya, Sullivan City, Hidalgo and Progreso Lakes.